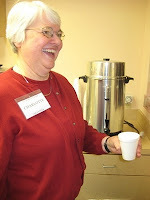 If you are a friend of St. John Center or even know of its existence, the name Charlotte Hazas, SCNA, has to ring a bell. She has done it all here. It started in 1987 when her priest helped her get a job at the Cathedral of the Assumption. Part of those duties had Charlotte coming to the Center as a job counselor. But she wanted to do more. So she went to Spalding University to get state certified as a drug and alcohol counselor. Charlotte continued to work her way up. Eventually, she became Assistant Director. “One of the best parts of St. John Center is that we reach people on so many different levels. Some guys come here just to get coffee or a hot shower. Others who are mentally ill look to us as a safe place where they are not preyed upon. Some come for drug or alcohol treatment, others are hoping to be placed in apartments,” said Hazas. Charlotte has helped men seeking all those needs for nearly two decades. In 2006, she retired. But that didn’t last long. “I knew I wanted to come back. I didn’t feel like myself. This place is a big part of who I am and what I’ve done,” she said. And it’s clear the men of St. John Center like and respect her too. A constant, “morning Miss Charlotte, it’s great to see you,” rings through the Center when she’s around. Charlotte spends a great deal of time passing on her knowledge and enthusiasm to others. One morning she was working with a student from Spalding University. She explained why some of the men need these services. A mentally ill man came up to get some coffee. After he left, Charlotte explained his situation and how if he was in close quarters he would become extremely agitated and act out. He feels peaceful here and that’s why he comes back.